Taylor Swift has become an icon of casual style. She is the queen in the red carpet, and the "street style" is not an exception. The singer knows what are her strengths and exploited them to the full with clothes and accessories that will work better. We reviewed her favorites signatures. 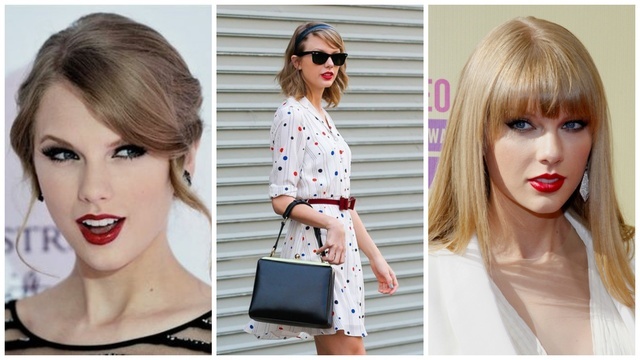 Taylor Swift’s red lips have become her signature of beauty style. Even when she goes out of the gym, she always has that red lipstick. "I just think my face looks worse without it", Taylor recently said and we agree with her. It is rare to see this artist with flat shoes, although she is very tall and has a sculptural figure. Taylor knows that high heels and stilettos stylizes her. She never misses a chance to use them. Taylor knows her legs are one of her best attributes. It is very common to see her wearing miniskirts and high waisted shorts through the year. Headband, hats and hair clips. Taylor loves accessories in the head. We always see these with her usual sweetness outfits. The singer always opts for pastel colors like light green, white and pale rose. Taylor combines them together because she is very feminine and these colors too. If you like this article, you might be interested in Taylor Swift and her Best Red Carpet Looks.